Letting yourself float feels fantastic. Not a care in the world while you are being spoiled from head to toe. Wellness & spa at Dolce Vita Spa Hotels in South Tyrol are pure luxury. Excellent massages and soothing baths spirit you away into a world of well-being. Dolce Vita Spa Hotels in South Tyrol are 5 excellent hotels near Merano. Enjoy the amenities of the exquisite spa hotels during your spa break in Italy. Let yourself drift and indulge in spa treatments at your Dolce Vita Hotel in the Vinschgau Valley. The gentle pressure on your shoulders, stroking movements and soothing touches are the delicious ingredients of exquisite massages at your Dolce Vita Spa Hotels. Tensions and blockages soften: you have finally arrived at your well earned holidays. Choose from a wide range of massages and spa baths. You will encounter classic massage techniques and the best from five continents. From the subtle massage methods of the Far East to the tradition of the Alpine area, from Ayurveda to Lomi Lomi, from soothing herbals stamps to singing bowls and much more. This classic treatment is and remains the most popular method. From essential oils, to acupressure and acupuncture there is plenty to provide you with a new skin and body feeling. Calm, flowing movements are characteristic for Ayurveda massages. Prepare for your exquisite massage at the Dolce Vita Hotel with a soothing spa bath. The 'Wellness Around' programme grants you a wide range of choices of spa baths and body packs. Experience your bathing ritual with all senses. Listen to the splashing water, breathe in the fragrant scents and feel the gentle caress of the water on your skin. Close your eyes, enjoy some time for yourself and let your mind drift. Wellness and spa at the Dolce Vita Hotels are luxury - luxury for body, mind and soul. 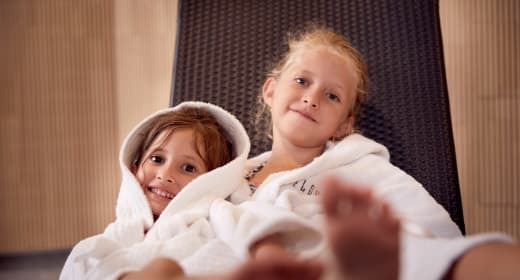 Get further information on the extensive range of spa offers available during your wellness & beauty holidays at one of the Dolce Vita Spa Hotels in South Tyrol. Send a non-committal request to your favourite Dolce Vita Hotel and inform the team of your desired appointment for a massage right away.